The prevailing view that blacks were cowards excluded any consideration of enlisting them for military fighting duty in World War I. 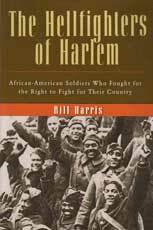 But because the nation was ill-equipped and low on manpower at the war's start, black troops were called into active duty, including the 369th regiment rooted in a New York National Guard unit centered in Harlem. General John J. Pershing, who'd had good experiences with black troops, was a strong supporter of blacks as fighters. Still, black infantry was banned from serving under U.S. command and were assigned to the French army. Harris recounts the numerous black troops' heroics and exploits, on and off the battlefield. He includes as a subtext the career of Lt. James Reese Europe, the black jazz pioneer whose band dazzled Europe and presented an American face often more appreciated in Europe than at home. Harris also provides an overview of black military involvement from the Revolutionary War through the Gulf War, highlighting history unknown by many.